Meet your Expedition 350 science team! I believe the entire crew is also suffering from this problem. Sorry – I meant the ‘Entier’ domestic crew who have fed us and cleaned our cages so brilliantly for the last few weeks. 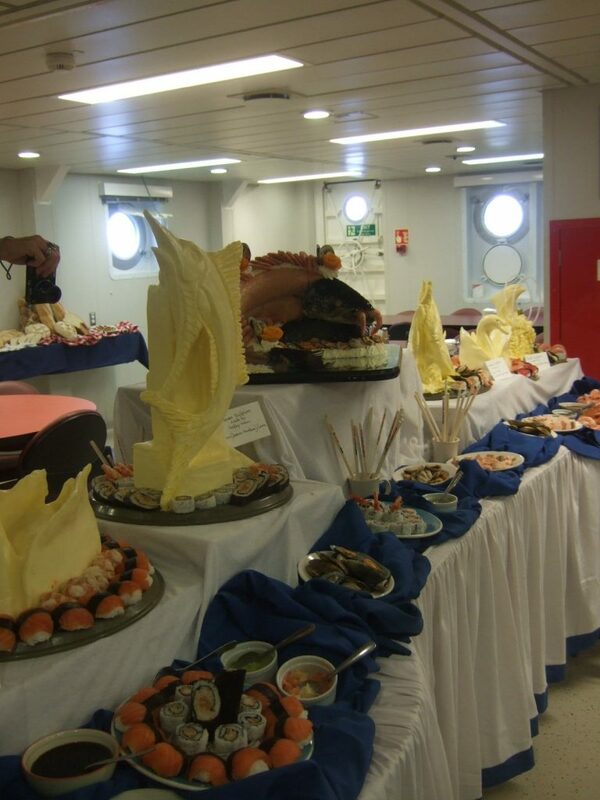 They obviously share our need for novelty, so they put on yet another fabulous buffet lunch today. It was a veritable feast of fish and chocolate (not in the same recipes) but this time, instead of vegetable-based sculptures, the art-work was made from margarine! Now I knew about this in advance from one day last week when I went into the galley area looking for our Camp Boss, Paul Trainer, and found him up to his elbows in what looked like butter, rolling a lump the size of a cricket ball around in his hands. Intrigued, I quickly shut the door. He tried to escape but his hands kept slipping off the door handle, which offered me the opportunity to interview him in the act of creation. LA: What on Earth are you doing with so much butter? PT: (confidentially): Can ye keep a wee secret? LA: (cautiously): Er, it depends what kind of secret it is. PT: (walking into the cold store): Come with me – I’ve got something to show ye. LA: (even more cautiously and nervously looking at my watch): I haven’t got long…. PT: (triumphantly pointing to a huge butter swan): There! What do you think of that! LA: Oh! How long did that take to make? Is it pure butter??? PT (disappearing behind a set of racking): Come on, come on…there’s more! LA (keeping my back to the door): How long have you been making these sculptures? Is this your hobby? PT: I just like it. The rest of the crew have been making them too! Would you like to have a go? LA: I’m not sure I could cope with this much butter. PT: Ha! It isn’t butter, it’s margarine! LA (sliding into his trap): That is really amazing – I wouldn’t have thought margarine had enough strength to allow such detail! PA: It is a wonderful material to work with, the way it slides through the fingers…..
LA: Paul, when did you first realize that you were attracted to margarine? PT: It started when I was a wee child when I stuck my finger in the margarine tub, and then it progressed to rolling balls of it and then I just – well – I just couldn’t stop myself. Eventually I was stealing margarine from the fridge and making little people to play with. LA (remembering her child psychology lectures): Were you a lonely child, Paul? PT: No! I made lots of friends! LA: When you say made …. Paul, did you make all your friends out of margarine? LA: (calling after him) Paul, will you be using margarine…? These sculptures are really amazing – I can’t believe they aren’t butter! NOTE: I may have got some of the details wrong but we are now into week 7……..